I remember the rhubarb my grand-père used to grow in the garden. It was thick and green; and would be turned into jar-after-jar of compote which my grand-mère always kept in that little cupboard in the garage. On top of my grand-père’s tools, always neatly organised. One day, I’ll show you that garage. We would eat the compote on top of yoghurt for breakfast. Or spoon it onto a tart case and cover it with a creamy custard before baking. Rhubarb compote is one of those staples you can never have enough of. Wash the stalks under cold water, then chop into 1cm pieces. 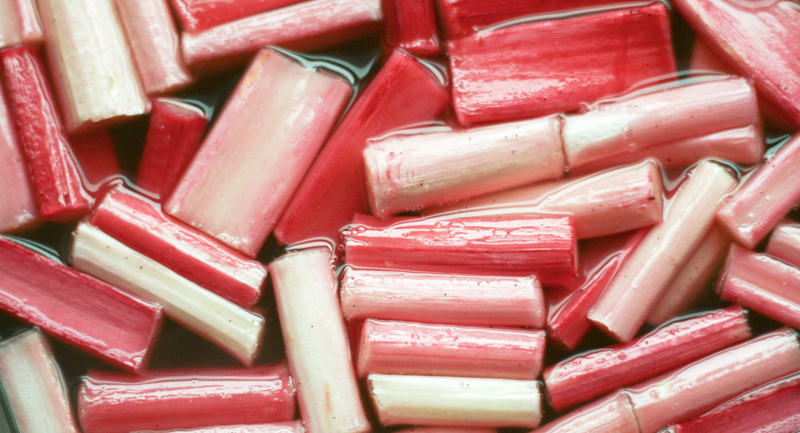 Weight out the rhubarb in a large bowl and combine with 20% of caster sugar. So let’s say, for 1kg of rhubarb, add 200g caster sugar; and of course, the seeds and empty pod from a vanilla bean. Mix well, cover with cling film and leave to marinate overnight in the fridge. The next day or a few hours later (cheeky version), scrape the fruits into a large pan and cook over medium heat – stirring every now and then, more so often towards the end – until the rhubarb has broken down and the syrup has reduced. If you’re canning, transfer to sterilised jars, close the lids and turn upside down before steaming for 30 minutes. Otherwise, just transfer to a plastic container and refrigerate until cold. You’ll have to use it within 5 days. And then, I moved to London, where rhubarb is pink and only comes when the trees are snowing with blossoms. It’s my favourite time of the year really. And my favourite colours too. These days my favourite thing to do with rhubarb is to roast it in a vanilla syrup. In a large pan, bring 300g of water and 300g of caster sugar to the boil, along with the seeds and pods from 3 vanilla beans. In the meantime, wash and cut 500g of rhubarb stalks into 3cm pieces and place them into a large roasting tray. Cover with the syrup and bake at 200°C for around 10-12 minutes. Allow to cool down to room temperature. I like to serve it on top of a cake. Perhaps with frosting, perhaps without. But in all measures, it should look messy and naughty. Because that’s what cakes are for. * Please tell me I’m not the only one who falls in love with some words. For the way they sound or look. 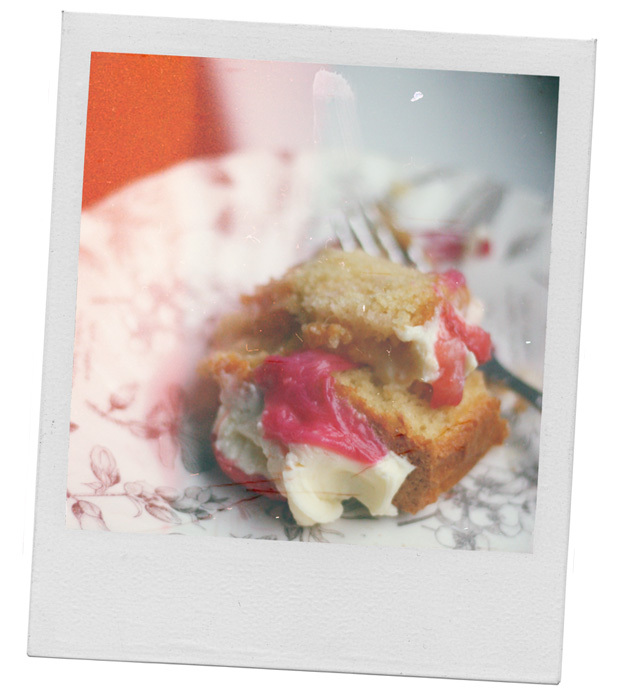 What is your favourite way of using rhubarb? And any little stories we should all know about? Tomber amoureux des mots qui parlent si bien de la vie. J’aime “rabarbrar” moi aussi. Perfect timing! I couldn’t resist buying a handful of luscious, pink stalks at the market yesterday and was just debating whether to roast them or bake with them. Roasting wins! Also, pamplemousse is one of those magical, love-at-first-sight words for me. It helps that it is the name of my very favourite fruit. Damn, pamplemousse is my favourite French word too. 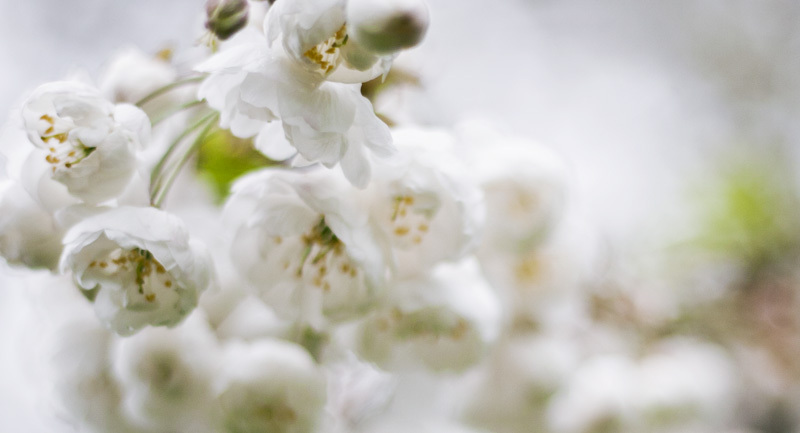 Such a wonderful little – long – word! J’aime la rhubarbe en compote associée à la fraise ou la framboise … ou alors en tarte façon crumble ! je suis super contente que les premières tiges soient revenues sur les étals ! I love the word rhubarb! When I was a little girl and said silly things my Dad would tell me I was talking rhubarb!! I love to make a gluten free crumble with it. I put chopped almonds and coconut in the topping which is yummy. Previous post: PS. We picked apples and made cider. Oh and an apple cake too!